Wow! Wow! Wow! The June Paper Pumpkin was full of bling and bright colors. I would never have imagined how vibrant and fun Lovely Lipstick looks with Lemon Lime Twist. I’ll have some posts on this fun box that was matched to the Broadway Bound suite in the catalog over the next few days. Here are the cards as designed using the instructions. I’m not sure why my picture of these two was a little washed out, but believe me, they are WOW cards. I love getting ideas for alternates from Pinterest but another source I use is the Paper Pumpkin Fan Club on Facebook. This group was started by Rachel Tessman. She is the Rockstar Diva of Paper Pumpkin. If you’re ever looking for ideas, check the group or her YouTube channel. The CASE for today is based off a card posted to the Paper Pumpkin Fan Club by Merrilee Mager. 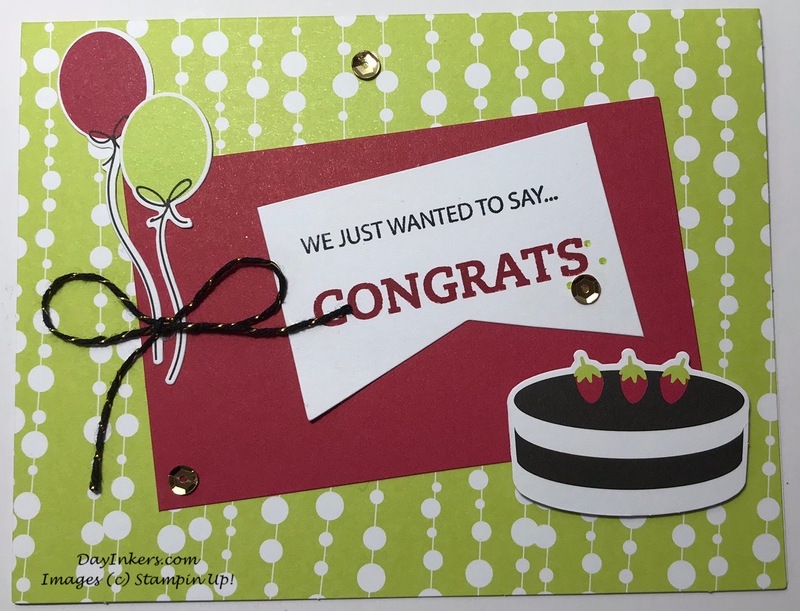 This card is almost identical to hers except that I moved the twine from around the top of the card to a bow over the balloons. Keep crafting. I’ll have more alternates for you soon!